Pope Francis exits Istanbul's Holy Spirit Cathedral Nov 29. Credit: Daniel Ibanez/CNA. “Thing will change! Of course they will. Even if just one small group of people is caught up in these ideas, then this small group will speak with others, and this larger group will influence other people… this is how things change, this is how things happen,” Baram said. Her words were echoed by those of Isabel, age 23. 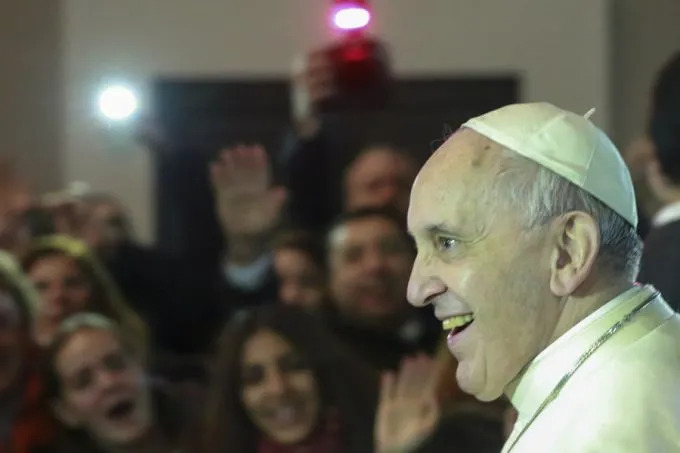 Pope Francis traveled to Turkey for a three-day trip at the end of November. His predecessor, Pope Benedict XVI, had also visited the country, making a trip there in 2006. Isabel said that Benedict’s visit – like all papal visits – brought joy and peace, but “things did not change a lot” because true change requires action by the people. Both Baram and Isabel took part in the Nov. 29 Papal Mass at Istanbul’s Holy Spirit Cathedral. Baram, a member of the Neocatechumenal Way, went with her group to welcome the Pope in front of the Hagia Sophia Museum. “When we determined that the Pope was coming, we prepared banners and flags to welcome him, and then we went very early to Hagia Sophia, singing for him and waiting for him. And then he arrived, and he was right in front of me…it was a moment I cannot explain,” she said. Baram attended the Nov. 29 Mass from the balcony, while Isabel was seated among the crowd within the Church. “I was just along the path where the Pope passed, and I had the occasion to kiss his hand when he came and when he went away,” Isabel recounted. Her uncle Ilyia was waiting for the Pope at the entrance of the church, and he was able to have a long moment with the Pope. She also reflected on the difficulties of living in a country that is majority Muslim. “Sometimes, I think that if we had lived in France, Italy, Spain, it would have been less difficult being Christian. It is not that I feel alone, but we are such a small minority here,” she said.